One of the strengths of GoldSim is that it offers several types of generic elements from which models can be constructed to represent almost any type of physical system. Because of the flexibility in how individual element types can be used as building blocks for complex systems, their default names and icons are generic. Element labels can be changed and element descriptions can be added to better indicate what an element represents. Another way to further customize an element to indicate what it represents is by changing the default element icon to a custom icon. As an example, the default icon for a Container element is a simple box. But what if that Container represents the operations of a pump or the inventory in a warehouse? You may want to change the icon to a custom one that represents this function or purpose. In this post, we'll show you how to do this and we'll point you to an icon library on our website that already has a number of icons you might like to use. An Example: A good example of a model in which default icons have been changed can be found here. This model simulates the reliability of a pump station, its controls, and a distribution system in order to calculate the overall risk to customers who pay for the water it delivers. 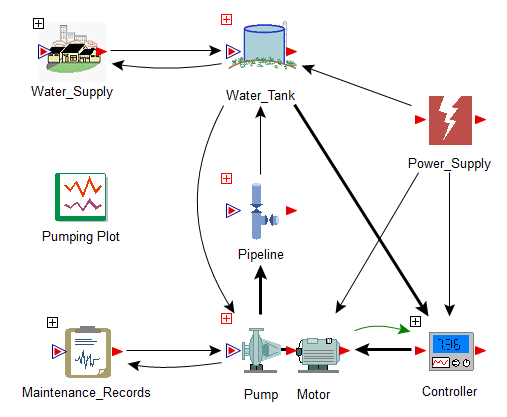 Containers and reliability elements with custom icons represent important components of the model, including a water supply, water tank, power supply, pipeline, controller, pump, motor and maintenance records. Changing an Element Icon: To change an element icon, right-click the element, select 'Appearance...', go to the 'Image' tab and then click the 'User-defined symbol' radio button. An 'Open' dialog will appear, allowing you to navigate to the folder location of the image file and open the new icon image. Note that GoldSim only supports the enhanced metafile (EMF) file format. GoldSim uses EMFs for element symbols because they are vector graphics and therefore scale without losing image quality. Resources: If you don't have any graphics software for creating and editing EMFs, take a look at this archived webinar that describes how to use GoldSim to create EMFs. Finally, take a look at our image library where you can download icons that are already in the EMF format. We’ve recently added a number of new icons.